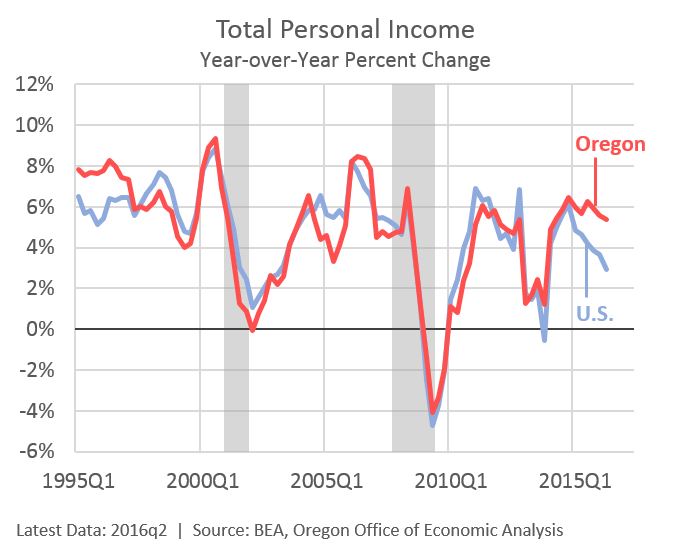 As we work on the next economic and revenue forecast (release date September 14th), I just wanted to share a quick update on Oregon personal income. Just as the economy and labor market are doing well, personal income is growing fairly quickly too. Gains today are as strong as those seen during the housing boom. Right now Oregon’s income growth over the past year ranks 5th best among all states and DC. Note 1: Actual data from BEA for Oregon goes through 2016q1. Given we have US income through 2016q2 plus Oregon employment, population, housing permits and the like, we can impute reasonable estimates for Oregon’s 2016q2 income. Note 2: The sharp drop in income growth in 2013 is due to the expiration of the payroll tax cut and of the Bush tax cuts on the highest income households which pulled forward their investment-related income into 2012. So what is driving Oregon’s stronger income growth? Pretty much everything. The biggest component here are wages, which have been consistently growing 6 or 7% annually in recent years. Withholdings out of paychecks have been even stronger, which matters for our revenue forecast. Right now Oregon’s total wages are increasing at the 6th fastest pace nationwide. Other income components are growing, albeit slower than wages. See the table below for the details. All of the above looks at total income in the state or total wages or total dividends and the like. Given Oregon also sees faster population growth and faster employment growth during expansions, you should expect to see some better total numbers in Oregon relative to the typical state. Unfortunately that has not always been the case. Similarly, Oregon’s employment and total wages typically outpace the nation. However if wages are not growing disproportionately faster than the typical state, Oregon’s average wage relative to the nation does not improve. This has also been the case for much of our recent history. However these patterns have flipped in recent years. Oregon’s per capita personal income is on the rebound following the big losses since the mid-1990s. Some of this is due to slower U.S. income growth (not ideal) but some is due to strong Oregon growth (which is ideal). However where the biggest improvements are seen are among average wages. We regularly write about this in our forecast reports and in our public presentations, but it’s worth highlighting again. Oregon’s average wage, at least in the past 50 years, has always been below the national average wage. We took a huge step back during the 1980s when the timber industry restructured. Oregon lost 12% of its jobs in the early 80s recession, whereas we “only” lost 8.5% of our jobs in the Great Recession. During the technology-led expansion in the 1990s, we regained about half of the decline in average wages and that held steady for more than a decade. However, since the Great Recession Oregon’s wages have outpaced the nation’s by a considerable margin. Oregon’s average wage today is at it’s highest relative point in more than a generation. Or put differently, Oregon’s average wage today is at it’s highest relative point since the mills closed in the 1980s. Some of this is due to the fact the recovery in Oregon has been led by high-wage jobs, even to a larger extent that nationally has been the case. But this industry or occupational mix can only explain a portion of our relative wage gains. The bulk of Oregon’s improvement here is due to stronger wage gains within industries and occupations. This is great news. It must also be pointed out, however, that national wage growth has been lackluster at best. So Oregon’s decent wage gains — they have not been particularly robust, but they are decent — look great in comparison. In terms of the outlook, our office expects continued improvement in the per capita personal income measure as our economic expansion is likely to continue to outpace the typical state. 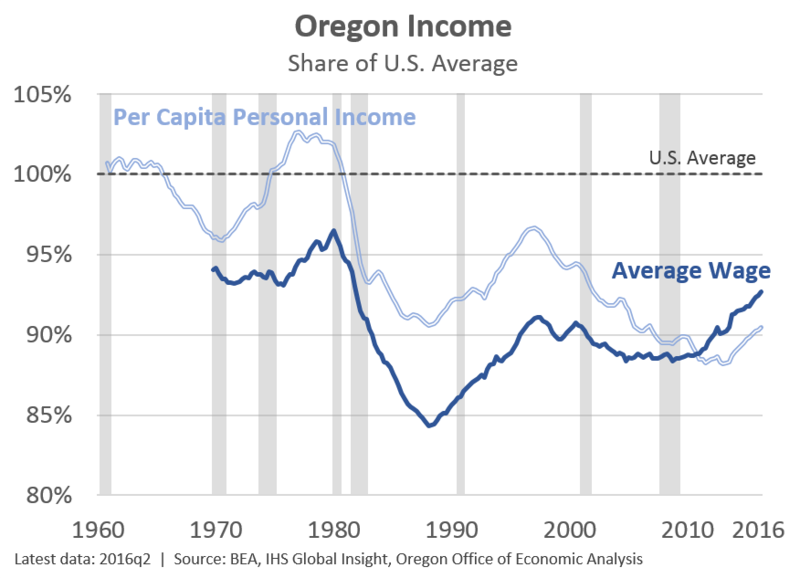 Yet our baseline outlook does not have Oregon’s per capita income converging with the U.S. The gap is large and would take a long time to close even during a strong expansion. For more on Oregon’s income relative to the nation and why per capita personal income misses the mark as the benchmark comparison, please see our previous post. « Oregon Unemployment, Deja Vu?